In true Swearing Mom fashion, I am going to make a cocktail out of this deliciousness, but first… a little history. 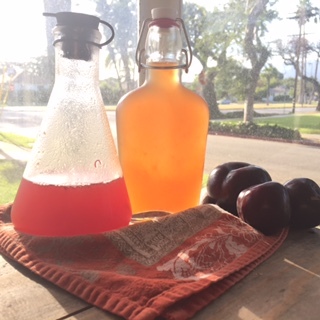 The Shrub, also known as Drinking Vinegar, dates back to colonial times when vinegared fruit syrups were mixed with spirits and were a popular way of “putting up” fruit to avoid waste. It can also be mixed with seltzer water or used to sweeten teas etc. 2 cups chopped fruit. I made two shrubs, a peach and a plum. 2 cups granulated sugar, I use raw turbinado. Place fruit and sugar in a bowl and toss until coated. Cover with plastic wrap and place in fridge for 2-5 days. Be sure to stir your fruit mixture once or twice per day for maximum yield. Strain fruit away from syrup and discard. I actually used the fruit in a smoothie to avoid waste but there’s not much else to use it for. You will be left with about two cups of a beautifully colored syrup. Add 1/2 cup vinegar to your syrup. Store in a bottle or mason jar with a lid in the fridge. The flavors will develop after a few days and the vinegar will mellow out a bit. Add 1oz peach syrup and 1oz Captain Morgan’s to a rocks glass and give it a little swirl. Add 1oz plum syrup and 1oz vodka to a rocks glass and give it a little swirl. Add ice to your glass and top off with club soda and a lemon twist. The non-alcohol version of this is delicious and refreshing. Pour some club soda over ice and sweeten to taste with your shrub. Next Post Lamb and Jam, Damned Delicious!